As the birthplace of the American Revolution as well as the birthplace of the first President of the United States, Virginia is a state steeped in history that goes back to when America was under British Rule. But the history doesn’t end there. Virginia was the state that saw more battles during the Civil War than any other, and it was there that the Civil War ended, at that little courthouse in Appomattox. Add to that the Civil Rights movement and you have a state that has seen the history of the county unfold before its eyes. Today a Virginia vacation can transport you back in time to when the struggle to be free (first for the new arrivals and later for the slaves) was at the forefront. It can also take you to one of the most scenic states in the country, with lots of activities for the entire family to enjoy. 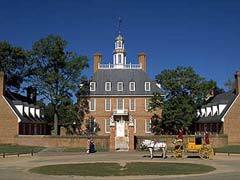 Colonial Williamsburg is bound to be in any Virginia travel guide as it is the place where America was born. The Historic Area allows visitors to see many buildings like the Governor’s Palace a lovely Georgian home surrounded by a formal garden, the Raleigh Tavern, where the gatherings took place to plan in the joining of the Revolution, and the Magazine, where muskets and cannon were stored. Tourists can also take in the Capitol, England’s first permanent colony in the ‘New World’ and the Courthouse among others that all have historical and cultural value. Part of Colonial Williamsburg and a great Virginia tourist attraction are the two historic sites that allow guests to participate in hands-on activities to get the feel for how life for enslaved Virginians was. The Peyton Randolph House and Great Hopes both get visitors involved in the culture, history and day to day life of slaves. Fast Forward to the Civil War era and Virginia comes alive once more. No Virginia vacation is complete without a trip to some sort of Civil War attraction. The Museum of the White House and the Confederacy, Manassas National Battlefield, the Stonewall Jackson House, The Virginia Military Institute, the National Civil War Museum or any of the other battlefields, monuments, museums and historical places that dot the landscape all make for exciting and informative lessons on the history of the state and the nation itself. Not all of Virginia tourist attractions are on the historical side however. 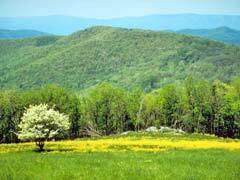 Visitors to the state also delight in the fall colors and beautiful vistas afforded on the Blue Ridge Parkway. Called America’s Favorite Drive, this 469 mile road stretches from North Carolina to Virginia along the eastern border of the Shenandoah Valley. The Valley itself is full of not only scenery but county fairs, zoos, museums, historic locations, caverns and waterparks and can be a Virginia vacation in itself as visitors tour the lovely towns and villages that lay within. The Chesapeake Bay is the largest estuary in the United States. The region is home to the birthplace of George Washington as well as the estate of Robert E. Lee and native Indian lands. The Chesapeake Bay Bridge-Tunnel is an engineering marvel as it spans the Bay taking motorists from Virginia’s eastern shore to the Norfolk/ Virginia Beach area on the other side. At just over 17 miles from shore to shore, this bridge/tunnel combination is the largest in the world. The Bay itself is a complex ecosystem of fish and plants that offers a great shared Maryland-Virginia tourist attraction with boating, camping, watersports and lovely trails around the region. The bustling city of Richmond offers guests the Museum of the Confederacy with the largest collection of artifacts from the Civil War including the personal belongings of Robert E. Lee and Jefferson Davis. The museum also has a look into the life of a soldier and what life was like on the homefront during those war years. 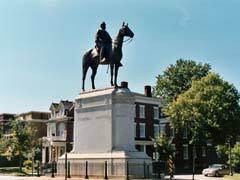 Monument Avenue is an outdoor museum that showcases the heroes and villains of the war in statue form amid historic homes, in which a nice walk allows you to take in the history. Tourists to Richmond can also take in the Canal Walk, the observation deck, the Virginia Capitol Building and the Edgar Allen Poe Museum. Being on the water, Norfolk is home to some more recent historical and military artifacts, like the USS Wisconsin and the MacArthur Memorial Museum. Here a Virginia vacation can take you on a Norfolk Historical Walking Tour, to the Cape Henry Lighthouse, The Norfolk Naval Base or the Virginia Zoo. 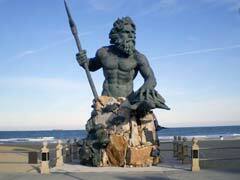 Just a hop, skip and a jump away is Virginia Beach, situated on the Atlantic Ocean at the mouth of the Chesapeake Bay. As one of Virginia’s best tourist attractions, the town boasts the Virginia Beach boardwalk, beaches, the Military Aviation Museum and the First Landing State Park where visitors can take in the natural beauty and the Cypress Swamps. For a total change of pace, be sure to visit Ocean Breeze Waterpark, minutes from the ocean and a haven for great family fun. Water slides, a wave pool and a water playground will all invite your family to have a splashing good time. Virginia is steeped in the history of the nation and is a place where tourists come to see that history brought to life. Choosing a Virginia vacation for your next getaway combines all of that history with stunning views and varied scenery that makes Virginia the place to be.